Merit is committed to increasing fibroid awareness as well as promoting a safe and effective alternative to surgery: uterine fibroid embolization (UFE). We do this by taking a two-fold comprehensive advocacy approach that addresses both patient and physician needs. At Merit, we believe knowledge is power, and we support patient education through our Ask4UFE® program. Furthermore, our diverse portfolio offers interventional radiologists the products they need to provide optimal UFE care. Ask4UFE is a program dedicated to women’s health, particularly uterine fibroids and the benefits of UFE. 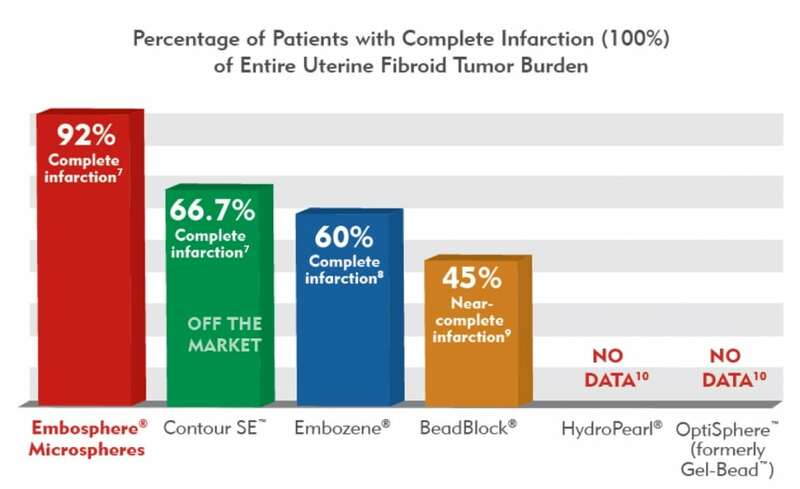 We accomplish this by providing women with educational resources, such as a website (www.ask4UFE.com), brochures, infographics, UFE patient testimonials, and monthly articles and newsletters based on the latest fibroid research. With continuous growth and engagement, we amplify our outreach efforts through social media, welcoming hundreds of thousands of new users to our online community each year. This Fibroid Awareness Month, we invite you to explore the many resources we offer that enhance fibroid care. Share Ask4UFE.com with your patients and discover how Embosphere Microspheres can support your embolization procedures. 2. Soliman, A. M., Yang, H., Du, E. X., et al. (2015). The direct and indirect costs of uterine fibroid tumors: A systematic review of the literature between 2000 and 2013. Am J Obstet Gynecol, Aug;213(2):141-160. 4. Katsumori, T., Kasahara, T., Kin, Y., et al. (2008). Infarction of uterine fibroids after embolization: Relationship between postprocedural enhanced MRI findings and long-term clinical outcomes. Cardiovasc Intervent Radiol, Jan-Feb;31(1):66-72. 5. Pelage, J. P., Laurent, A., Wassef, M., et al. (2002). Uterine artery embolization in sheep: Comparison of acute effects with polyvinyl alcohol particles and calibrated microspheres. Radiology, Aug;224(2):436-445. 6. Verret, V., Ghegediban, S. H., Wassef, M., et al. (2011). The arterial distribution of Embozene and Embosphere Microspheres in sheep kidney and uterus embolization models. J Vasc Interv Radiol, Feb;22(2):220-228. 7. Siskin, G. P., Beck, A., Schuster, M., et al. (2008). Leiomyoma infarction after uterine artery embolization: A prospective randomized study comparing tris-acryl gelatin microspheres versus polyvinyl alcohol microspheres. J Vasc Interv Radiol, Jan;19(1):58-65. 8. Smeets A. J., Nijenhuis R. J., van Rooij W. J., et al. (2010). Embolization of uterine leiomyomas with polyzene F-coated hydrogel microspheres: initial experience. J Vasc Interv Radiol, Dec;21(12):1830-4. 9. Chrisman H. B., Dhand S., Rajeswaran S., et al. (2010). Prospective evaluation of the embolic agent Bead Block in the treatment of uterine leiomyomas with uterine artery embolization. J Vasc Interv Radiol, Apr;21(4):484-9. 10. Searched pubmed.gov and Google Scholar for the following keywords and combinations: “uterine artery embolization”, “UFE”, “HydroPearl”, “GelBead”, “OptiSphere”, “uterine artery embolization”, “UAE”, “leiomyomas”, “uterine fibroid infarction”, “UFE”. 11. Laurent, A., Beaujeux, R., Wassef, M., et al. (1996). Trisacryl gelatin microspheres for therapeutic embolization, I: Development and in vitro evaluation. AJNR Am J Neuroradiol, Mar;17(3):533-540.